Steel cycle shelter - CICLO 190 - DIMCAR s.r.l. Public spaces > Urban furniture > Steel cycle shelter > DIMCAR s.r.l. Bicycle rack with Cycle Park model cover. 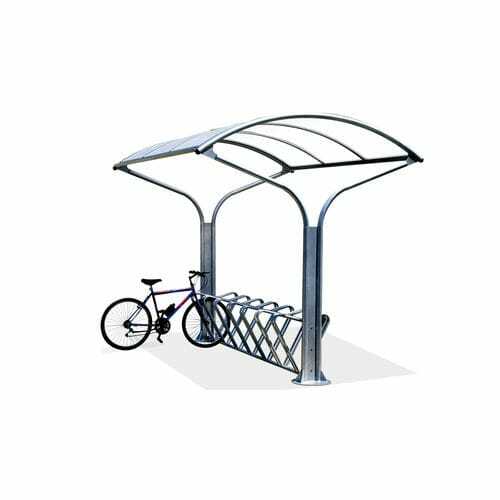 The structure consists of two side bicycle bicycle shelves consisting of two vertical loads and top arches in galvanized steel round tubing complete with spherical end PVC caps, each single structure is provided with a plate, base, galvanized sheet. Matted polycarbonate cover with opaque thickness supported by two horizontal currents in galvanized rectangular tube (back and front) and galvanized rectangular tube arches. Gutter, in the back and front, for collecting and discharging rainwater. Bicycle rack made up of two horizontal cross-links in galvanized steel tube tube, galvanized steel round bolt stem bikes with possibility of parking on both sides for a total of fourteen bicycles. The fixing to the ground is done by means of a plinth or a cement base, eight threaded hooks will be placed in the concrete with a special template not provided. The type of foundation to be constructed must be evaluated by a qualified technician, depending on the characteristics of the ground on which the Cycle Park will be located (eg punctual and deep foundations that act as tie rods or continuous foundations suitably dimensioned). The base finishing The metal parts of this product are of "brilliant aluminum" color characterized by a light gray metallic effect. The customer may, however, require a different finish, chosen from the RAL colors available on our website. The painting technique used for the galvanized steel structure is made of thermosetting powders with baking.